The Button Show, 100 Episodes … with Notes! Imagine that your local community college offered a free course for anyone interested. You don’t even have to register, you just show up every week to learn more about the current state of personal technology; smartphones, tablets, computers, and the Web. You love your smartphone but sometimes it seems to outsmart you and you want to learn more, so you start attending the class. Now imagine that you don’t even need to go to the community college, you can take the class in the comfort of your own home, sitting in front of your computer or your Smart TV! If you like technology and you like to learn, you’ll love our show! It’s a weekly educational show on YouTube by Geeks on Tour. We usually go about 45 minutes. Past topics include “What is the Home Button?”, “What are Location Services?”, “Facebook Tips”, “How to Keep my Battery Charged”, “Navigating with Google Maps”, and “Google Photos FAQs.” The show is usually just Jim and me (Chris) but we sometimes have guests as well. We use multi-media to teach our lessons. We do some discussing of topics, but there’s a lot more than chit-chat. We usually have a PowerPoint slideshow to explain concepts and go over important points, and we always have live demonstrations using both Apple iOS devices like the iPhone and iPad and Android devices like Samsung phones, or Nexus tablets. Sharing our computer screen, we also demonstrate features on the web. Even though we’ve produced 100 episodes, we’ve just begun! We keep learning new things, getting new devices, and there is constant change! What if you don’t want to watch the whole show? Or, what if you watched a show a few weeks ago and just need to remember one thing? We’ve taken your class notes for you! Here’s a sample: Show Notes from Episode 93 in .pdf format. Every section of the notes includes a time link. Clicking that takes you to the YouTube video at the point where that section begins. Become a member and you get all of them. 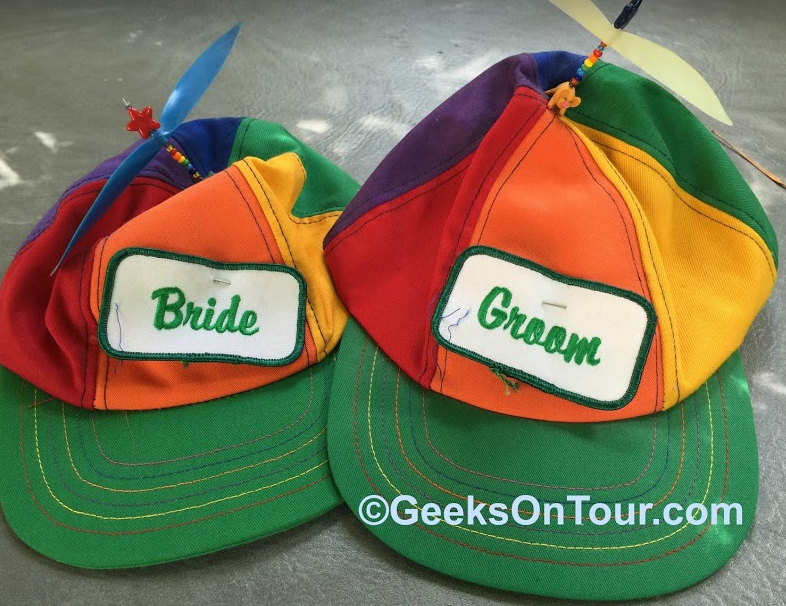 If you are a Geeks On Tour member, you can visit the Weekly show page and there is a link to every show with notes. $.99 per episode at TheButtonShow.com. If you are not a member, we are starting to make the .pdf versions available for $.99. All 100 .pdf show notes are on our Learning Library USB Drive for $49. It also includes all our tutorial videos and eBooks. If you Subscribe to our YouTube Channel (and click the little bell for notifications) you will receive notice whenever we are going live. Usually that is every Sunday at 2pm. If you watch live, you can leave comments/questions in the chat window and we may answer during the show. We also sometimes invite viewers to jump into the live stream after we stop broadcasting for further discussion. On Wednesday, we post the show on TheButtonShow.com, complete with show notes. The show notes are a benefit of membership. If you are a Geeks on Tour member, you have access to all the show notes. What’s with the Propeller Hats? If it’s not fun, it’s not worth it! We try not to take ourselves too seriously. I can get a bit too “teachy” sometimes and Jim can get too “techie.” The hats are meant to remind us to have fun. Propeller-Head is another word for Geek! These beanies have been our signature since we were married nearly 20 years ago! Published by MrsGeek, in Blog. Tagged with #ButtonShow, #GeeksWhoTeach, #TheButtonShow, #WDTBD, Apps for Travelers, Geeks on Tour, Learning Smartphones, Smartphones, Technology for Travelers, Tutorial Video, Weekly Show. Love the show even if I have never watched it live. Love the show notes too.